Anne Hutton | Big Eyebrows: They’re Here to Stay! 19 Sep Big Eyebrows: They’re Here to Stay! Ladies, the “big brow” trend isn ‘t going anywhere fast, so if you are considering growing out your brows now is the time! Treat your Brows (and lashes) like you Treat your Hair! How can you expect to have full healthy brows if you don’t treat them with care? Condition your eyebrows with a good quality brow conditioning product. This’ll help to stop breakage and allow them to fill out and reach optimum length. Similar products can be used on the eyelashes too, such as Rapidlash. Shaping the brow properly to suit your face shape and natural brow shape is very important. Your brow technician will leave the hairs in place that are needed to thicken up brows, and merely tidy up the brow and re-shape as necessary. It may take a couple of visits before they are at their best. 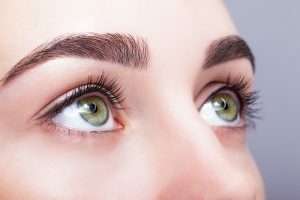 Book in with an experienced brow expert and have your brows professionally shaped and tidied, and tinted if necessary. The tint makes all the difference in filling out the brows and evening out the shape. Saver: A good quality Eyebrow Tint & Shape & Tidy. Don’t chance it with your brows – go to somebody experienced with a good reputation for brows. *Looking for an eyebrow specialist in Carlow? A professional brow tint and shape at my studio costs €22. Full price-list here. Keep your brows well groomed, and hold in place with a brow gel by combing through and shaping, or use hairspray sprayed directly onto a clean mascara wand and brushed through brows- cheap and cheerful! Saver: Hairspray on an old mascara wand. Practically free. Even after tinting you may have some gaps that need to be filled in. Use brow pencil, or a powder in the correct colour. Blend in by brushing through gently with a brow brush. Do this discreetly, nothing shimmery or shiny. Use a light creamy textured brow highlighter such as Benefit High Brow (or a light coloured concealer) to highlight the brow bone and give a great brow shape, also giving coverage to small hairs while growing out the brows. Et voila, perfect brows for you! Go on give it a go and let me know how you get on.